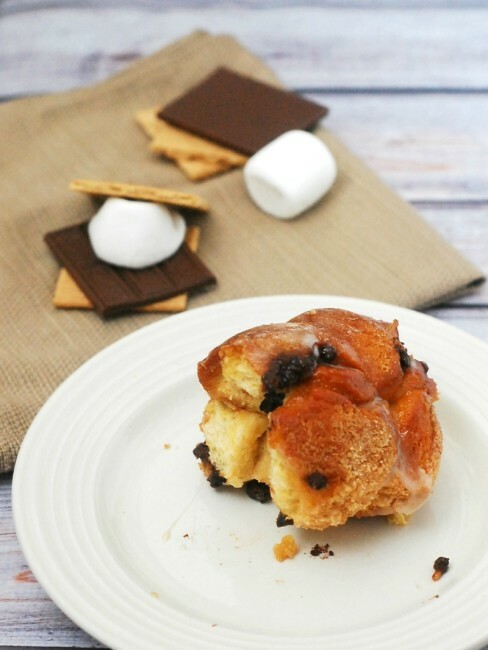 Nothing says summer snack likes s’mores monkey bread! Little balls of sweet bread are coated in graham cracker crumbs and baked with layers of chocolate and marshmallow. 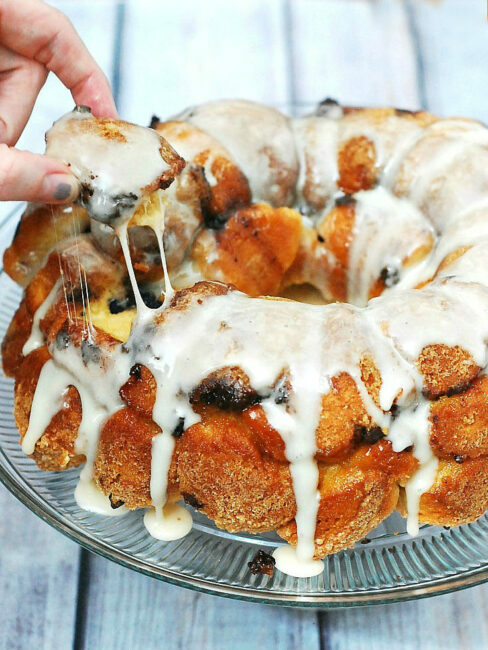 Traditionally, monkey bread is flavored with cinnamon, sugar and chopped pecans. But seeing as this seems to be the “Summer of S’mores” (hello, S’mores Frappuccino and S’mores Oreos! ), and s’mores are one of my favorite snacks, I had to give s’mores monkey bread a try. This snack is a hit with kids and adults alike. Who could resist bite-size pieces of sweetened bread dough coated in sugar and graham cracker, baked with chocolate and marshmallows, and coated in marshmallow glaze? The recipe itself is not hard, though does take some advance planning, as the dough needs to chill overnight. Bring this to your next summer get-together, and you’ll be the hero of the party! Place the warm water in the mixing bowl of a stand mixer, add the yeast and stir to dissolve. Let it sit for 2 minutes. Add the milk, melted butter, sugar, eggs, salt, and 3 cups of the flour. Using the dough hook, beat on high speed for 3 minutes. Lower the speed, and gradually add more flour from the remaining 2 cups, just until a firm dough forms. You may not need all of the remaining 2 cups. Scrape the dough onto a floured surface. Firmly and rhythmically knead by hand just until smooth and elastic, about 5 minutes. The dough is ready when you poke it with your finger and it springs back. Form the dough into a smooth ball Spray a large bowl with nonstick cooking spray, place the dough ball inside, and spray the top of the dough with more spray. Cover tightly with plastic wrap and chill in the refrigerator for 8 hours or overnight. When ready to bake, preheat oven to 350 degrees. Spray a 10-12 cup bundt pan (NOT a tube pan) with cooking spray. Set aside. Gently press the cold dough down with your fingertips to release the air bubbles. Flatten into a large disc and use a chef's knife or bench scraper to cut pieces of dough and roll into balls, about 1.25 inches in diameter. You should yield about 40 dough balls. Place the 1/2 cup of sugar and the 1/2 cup of graham cracker crumbs in a gallon-size ziptop bag. Add the melted butter, seal the bag and shake to combine. Add four to six balls of dough to the bag, seal and shake to coat. Place the coated dough balls in the bundt pan, and repeat with remaining dough balls. Once you have a layer in the bundt pan, sprinkle some of the mini chocolate chips and mini marshmallows. Cover with another layer of dough balls. Sprinkle in more chocolate chips and mini marshmallows, and cover with more dough balls. Bake the monkey bread for 30 minutes. While the monkey bread is baking, make the glaze: melt the marshmallows with the water in a double boiler over barely simmering water. In a separate saucepan, stir together the sugar, milk, and corn syrup. Bring to a boil over medium-high heat, then lower the heat and simmer for 5 minutes. Pour the milk mixture over the marshmallow mixture and stir to combine. Remove from the heat and stir in the vanilla extract. Remove the monkey bread from the oven, and let stand for 10 minutes. Then flip the pan over a serving plate, and tap sharply on a table to help the monkey bread out of the pan. Pour the marshmallow glaze over the monkey bread and serve warm or at room temperature. Our theme this month is A LITTLE SOMETHING SWEET. For more bread recipes, visit the #TwelveLoaves Pinterest board, or check out last month’s mouthwatering selection of #TwelveLoaves Mexican Breads! 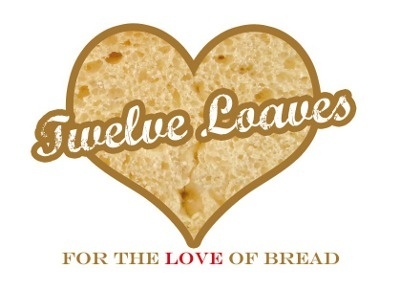 If you’d like to bake along with us this month, share your “A Little Something Sweet” Bread using hashtag #TwelveLoaves! 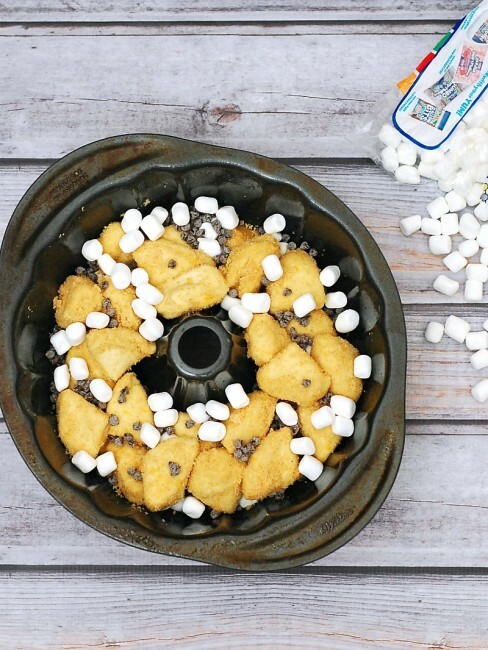 My kids LOVE monkey bread and your s’mores version looks incredible! I hope to treat my family to this spectacular breakfast very soon. I have a feeling that my fingers would become uncontrollable around this beautiful bread! It just sounds delicious! That is downright dangerous! I don’t think I could stop eating it until it was all gone! Beautiful! Yep, this bread is a LOT of something sweet … and I love it! 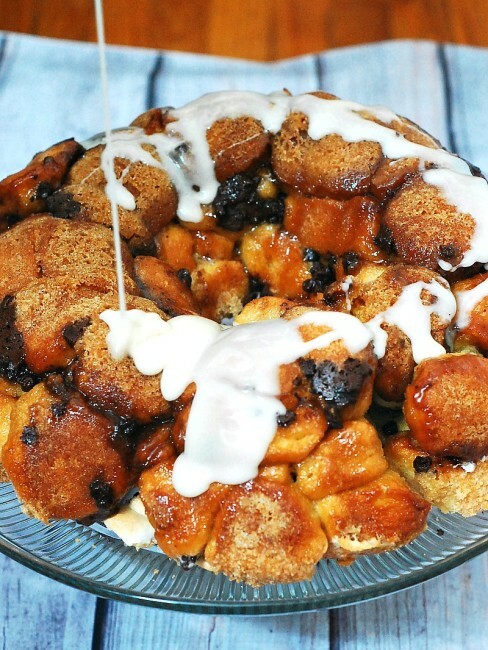 I am a huge fan of monkey bread … and your smores version is divine! Oh, my goodness! Yes, that is more than a little something sweet and it is just divine! 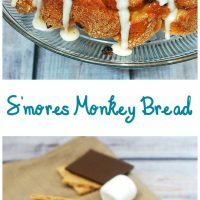 We love monkey breads and now I’ve got to bake my kiddos this fun s’mores version! !